The Coveo Platform implementation can be easily scaled to serve the search needs for various enterprise sizes, from a single department to a large global international organization. 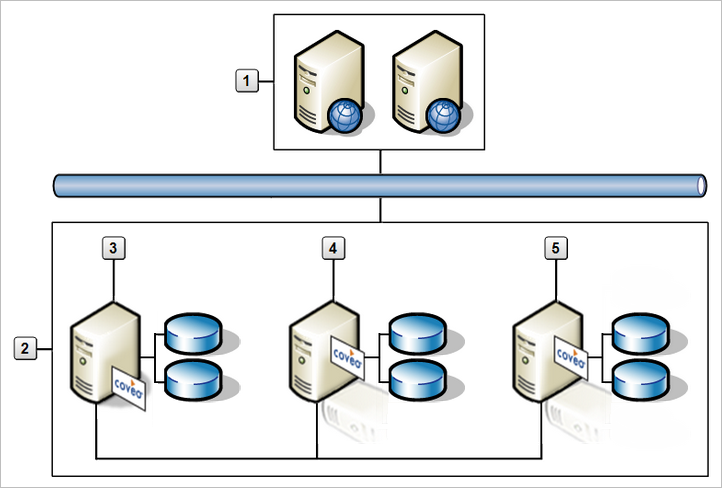 The Coveo scalability model allows to operate either with a single Coveo server, with one Coveo instance composed of two or more Coveo servers, or with two or more inter-connected Coveo instances. Note: Additional licensing is required for Coveo instances configured with more than one server. In its simplest form, a Coveo instance is entirely hosted on one server that performs all the processes (crawling repositories, converting documents, hosting the index, hosting the search interface website, handling query requests, and returning query results) (see Installing CES on the Master Server). When the number of documents to index increases, hosting the index on a single hard disk leads to size and performance limitations. On one Coveo server, the index can be divided in up to two slices, each on a separate disk (see About Index Slices). When the index size exceeds the capacity of one server, you can create other Coveo instances and federate search results (see About Geographically Distributed Indexing). When one Coveo server handles all the CES processes and the rate of queries increases, the users may eventually feel that the system is slower, typically when the results are no longer returned within a second. Adding one or more Coveo Mirror servers allows supporting significantly more queries while maintaining sub-second response time 90 % of the time. A Mirror server holds a copy of the master index and continuously receives updates from the Master server (see About Mirror Servers). When IIS on the Master server is overloaded and cannot adequately serve search interfaces, one or more Coveo Front-End servers can also be added to distribute the website hosting of search interfaces and the handling of search queries. The Master server and the Mirror servers are typically set up in a network load-balancing (NLB) configuration to provide optimized service availability and failover capability. For the same reasons, Front-End servers can also be set up in a separate NLB cluster (see Configuring Coveo Servers in a Network Load-Balancing Cluster). When document conversion requires significant server resources, the document conversion process can be distributed to one or more Coveo Remote Converter servers to free the Coveo Master server from this task. This is useful for example when converting numerous documents involving the CPU and physical memory intensive optical character recognition (OCR) module. Within an organization, separate Coveo instances may be distributed in different departments, buildings, cities, or even continents. Multiple Coveo instances can be set up to form a geographically distributed index (GDI). Queries entered in a search interface of one Coveo instance returns results gathered and ranked from two or more Coveo instances (see About Geographically Distributed Indexing).